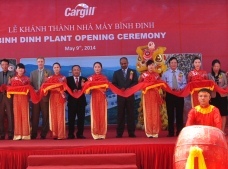 Binh Dinh, Vietnam – May 10, 2014 – Cargill’s animal nutrition business recently celebrated the completion of its US$20 million animal feed mill expansion in Vietnam’s Binh Dinh province. 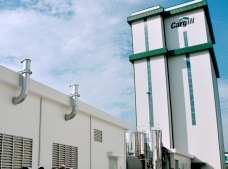 One of eight compound feed mills in Vietnam, the expanded facility will enable Cargill to meet growing demand for high-performing feed from its customers in the country. With this expansion, Cargill has invested more than US$110 million in Vietnam’s livestock and aquaculture industry during the last 10 years. 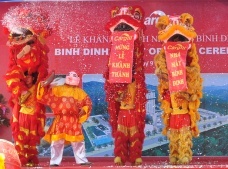 The Binh Dinh Plant opening ceremony was attended by leaders and dignitaries and was celebrated with traditional drummers and dancers. The celebration featured traditional lion dancers. An aerial illustration of the expanded plant is pictured behind the lion dancers. The newly expanded Cargill animal feed mill plant will increase the plant’s capacity by four times, from 60,000 tonnes per year to 240,000 tonnes per year. The expansion increases the plant’s capacity by four times, from 60,000 tonnes per year to 240,000 tonnes per year, and incorporates Cargill’s uncompromising approach to feed safety, ingredient quality and product integrity. The company aims to provide customers with safe, trusted feed that maximizes the performance of their operations, which in turn helps to improve food safety across Vietnam’s supply chain. Cargill continues to grow its animal nutrition business in Vietnam in order to meet customer demand for quality feed. In 2012, it committed to building more animal feed plants in the country, doubling its feed capacity to 1.5 million tonnes per year by 2015. This new plant expansion means that Cargill now has a total compound feed capacity of 1.4 million tonnes in Vietnam and will create approximately 50 new jobs across sales and support functions in Binh Dinh. Additionally, in order to help raise farming productivity and incomes, Cargill has provided training to more than 1.5 million Vietnamese farmers in best practices in animal husbandry through its farming workshops. Through Cargill Vietnam’s school building program, two schools have already been built in the Binh Dinh province. The program has to date built 65 schools in rural communities across Vietnam and is committed to building 75 schools in Vietnam to help educate about 15,000 students by 2015.